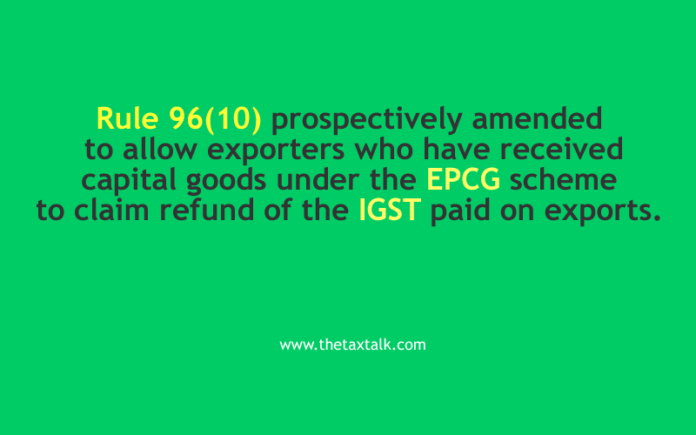 Rule 96(10) prospectively amended to allow exporters who have received capital goods under the EPCG scheme to claim refund of the IGST paid on exports. the refund of input tax credit, availed in respect of inputs received under the said notifications for export of goods and the input tax credit availed in respect of other inputs or input services to the extent used in making such export of goods, shall be granted.”. (b) availed the benefit under notification No. 78/2017-Customs, dated the 13th October, 2017, published in the Gazette of India, Extraordinary, Part II, Section 3, Sub-section (i), vide number G.S.R 1272(E), dated the 13th October, 2017 or notification No. 79/2017 Customs, dated the 13th October, 2017, published in the Gazette of India, Extraordinary, Part II, Section 3, Sub-section (i), vide number G.S.R 1299 (E), dated the 13th October, 2017 except so far it relates to receipt of capital goods by such person against Export Promotion Capital Goods Scheme.”. Note :- The principal rules were published in the Gazette of India, Extraordinary, Part II, Section 3, Sub-section (i) vide notification No. 3/2017-Central Tax, dated the 19th June,2017, published vide number G.S.R 610 (E), dated the 19th June, 2017 and last amended vide notification No. 53/2018 – Central Tax, dated the 9th October, 2018, published vide number G.S.R 1007 (E), dated the 9th October, 2018. 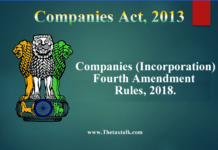 Companies (Incorporation) Fourth Amendment Rules, 2018. 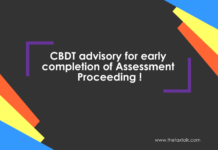 CBDT advisory for early completion of Assessment Proceeding !